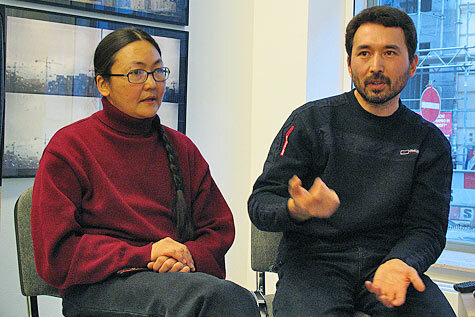 Muratbek Djumaliev and Gulnara Kasmalieva - video artists and art activists from Kyrgyzstan. lingua franca of sorts, through which the seemingly isolated experiences of Central Asian artists were effectively translated for an international audience. At the forefront of this movement is the collaborative duo Gulnara Kasmalieva and Muratbek Djumaliev, who live and work together in Bishkek, Kyrgyzstan. They have dedicated themselves to the task of cultivating a vibrant contemporary art community in their country, where all traditional infrastructures for the education and support of artists have long since been abandoned by the government and no models for private philanthropic, corporate, or foundation assistance have ever really existed . At the same time the pair have been producing their own videos, photographs, and performances, which aim to unpack multiple layers of Kyrgyz identity, including the country’s traditional nomadic and shamanic roots, its Soviet past, and the new republic’s tenuous position in the current global capitalist system. At its essence, theirs is a practice that redefines the terms of art in the face of what Djumaliev refers to as "the collective phobia, skepticism and disappointment" that pervades the milieu they inhabit. Melding the poetic with the political, they employ evocative imagery with minimal narrative structure in order to tell poignant stories of human struggle, perseverance, and hope for the future. jybek jol, or the "Silk Road." Over the course of a several-day-long journey, Kasmalieva and Djumaliev recorded the process of sorting and packing scrap metal for truck transport between Kyrgyzstan and western China. As they trailed the eastbound caravan their cameras captured the sculptural beauty of the antiquated Soviet-era vehicles, precariously stacked to their brims with scrap. These images are juxtaposed with those of the pristine and powerful Chinese big-rigs that travel west into Kyrgyzstan with new readymade goods to sell. The five-channel installation interweaves views of trucks in the landscape with scenes of the rural communities that have long populated the plateaus as well as the provisional villages now springing up near the road in a reflection of the scrap economy’s viability. Through deft video and sound editing, the artists hone in on the patterns and cadences formed amidst the chaotic activity, exposing the humanity in an account that is at its essence about global economics. All screens open with humming trucks crisscrossing through the mountains, followed by the clinging sounds of the collecting, sorting, and loading of metal. We experience the rhythmic packing and taping of giant parcels in the bustling marketplace before the camera cuts back to mountainscapes where truckers and villagers come together in festive celebration. A young rural man plays accordion and sings a traditional Kyrgyz ballad, an ode to the unique landscape of his homeland. Closing the cycle, we return to the trucks, the basis of a new economy. In the final scene a young boy on horseback gleefully attempts to race a heavily laden truck as it slowly makes its way uphill, overtakes the summit, and speeds into the distance, finally leaving the child and animal behind in a cloud of dust. What may at first appear to be a condemnation of the effects of progress on this community is, rather, a picture of hope. The existence he and his parents before him have always known is, indeed, quickly changing, but here he is ready and eager, despite the obvious hurdles, to ride right into the future . Devoid of nostalgia for the ancient Silk Road, with all of its romantic connotations, Kasmalieva and Djumaliev’s project foregrounds instead the contradictory currents in the existence faced by the living, breathing populations along these well-worn trade routes. The artists’ clear focus is the entrepreneurial ingenuity and perseverance that have taken hold in recent years, and an intimation of the possibilities that may lie ahead. In the Shadow of "Heroes" (2005) and Zone of Risk - Transition (2006) bringing international and regional work together in order to provide local artists with broader contexts for their practice. Into the Future is also the title of a 2005 video by Kasmalieva and Djumaliev depicting the comings and goings on a Siberian ferry boat. Assistant Curator of Contemporary Art at the Art Institute of Chicago.